JibberJabberUK: Finance Fridays - Do you need a short-term loan? Finance Fridays - Do you need a short-term loan? We were talking about spending differences between generations for last week's Finance Fridays. 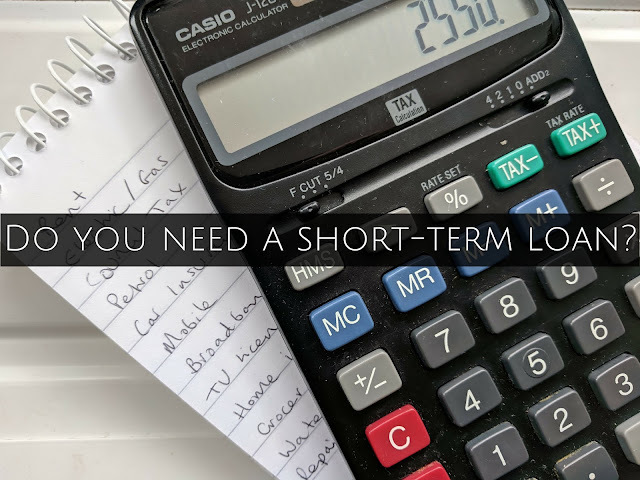 This week we are looking at whether you need a short-term loan. There are many different types of loan on offer now so it is important to assess how much you need to borrow and for how long. To guide you through have a read of today's guest post. “Life is filled with the unexpected. Your car inexplicably breaks down even though it sailed through the MOT last month. Your boiler stops working in the middle of the coldest winter since records began. While it's nice to think that we will always have a rainy-day fund ready for these unwanted surprises, it's not always possible to budget for the future. If something has happened that you need to quickly find cash for, you might be eligible for a short-term personal loan. This is usually a small amount of money paid back in monthly instalments and can help to fix the leak in the roof or repair the car. Do You Need to Take Out a Loan? As with any form of borrowing, it is important to make sure you have thought carefully about whether you need to take a loan out. There are many factors to consider - from the repayments to the interest rates. If the reason for the loan outweighs taking it out, you then need to look around for the one that works for you. The short-term loan you opt for to fix your car, might be different to the one you would use to replace the roof on your home. Look into every detail before you commit. Of all the positives for taking out a short-term loan, the biggest one is that, like a lot of traditional loan providers, the funds usually go into your bank soon after you have been approved. This means that you can use them to solve the problem quickly. Although you're borrowing money to resolve the issue, by doing the research ahead of applying, you'll know that it works for you and you are able to repay it. On the subject of repayments, this can be a negative for taking out a short-term loan. While you may be able to pay for the amount you take out fairly quickly, there is often higher APR on this type of loan because of its short-term nature and the credit history of the borrower. If you have a poor credit rating, a lender may perceive you to be a higher risk than other applicants. However, lenders must be up front about the APR charged and you should be able to make your decision on which loan provider to go with based on this information. One of the biggest issues for those taking out any type of loan is that they have a bad or poor credit history. This could be for any number of reasons, from missed loan repayments in the past to CCJs. Whatever the reason, this can often make or break being approved for a loan. However, if you have a poor credit history, there's no need to leap at the first approval you receive. Instead, take time to think through your options and shop around. Some loan providers can offer better deals in terms of APR and repayment amounts. If you want to join in with this week's Finance Fridays then add your link to the linky below. Any post concerning financial matters is allowed. Full details here. It doesn't have to be published today as you have until 23.55 on Tuesday 25th September 2018 to join in.